There are many disappointments in our lives. Santa never brought you that candy apple red Schwinn Stingray you had to have when you were 9. Daddy never bought you a pony. Your mother made you eat lima beans. Don’t worry, mine did too. Heidi Klum didn’t like your dress on “Project Runway” and told you were out. (But then she kissed you. Twice.) And there is never a parking spot when you need one. About a year ago my office moved to a new location. It only moved a mile or so, but it moved a way from the BART station. The City of Oakland does provide a free bus service that goes from BART to a few blocks from the office. Sadly, the bus is not a time saver over walking. Thus, my commute has increased by 20 minutes each day. This necessitates driving to work on occasion, to make sure I am on time for early meetings. Parking in our neighborhood is unique. The lot next to the office is $6 for 12 hours. That’s it, no options. Across the street, and connected to the building over the train tracks, is a lot that charges $7 if you are in by 10 and out by 6. Needless to say I generally work well past 6. And when that lot changes to hourly, it is $2.50 per hour. Of course I can afford either of these, but it galls me that I must pay for parking after driving and spending $10 or so in gas. Call me petty. There is plenty of street parking within 4 blocks of work. What makes it tricky is that there is a mix of parking meters (too expensive), 2 hour parking (too short) and 4 hour parking (almost just right). If I get to work before 9 am and move my car by 1 pm or so I can park for free. A lot of thought has gone into this strategy. I know the meter maids are focused on the meters. 4 hour spots are probably almost an afterthought. What are the odds my car is being viewed right when I park? 0. I figure there is also some grace between checking, so that it is a 5 hour window, if not more. I drive at least 1 day per week and I’ve not gotten a ticket yet, knock on plastic. When it comes to parking, people can be very touchy. Perhaps you’ve seen the TV show “Parking Wars” where drivers and meter maids to at it tooth and nail. No one ever believes they deserve a parking ticket. Of course they do 99% of the time when they get one. I also recall a study that was done years ago that proved that people took longer to leave a parking spot if someone was waiting for it. It was a form of territoriality, drivers keeping what they perceived as theirs, not wanting another to have it. That ranks right up there with people not wanting to split the bill at lunch or dinner in a group because someone “ordered something expensive” or “I didn’t have a drink.” People are petty. Don’t go out with a group if you can’t handle sometimes paying a bit more or bit less. It evens out over time. And don’t park in a spot if your fragile psyche can’t handle knowing someone will park there after you. It is not your lover; it is a cold, undeveloped piece of ground. 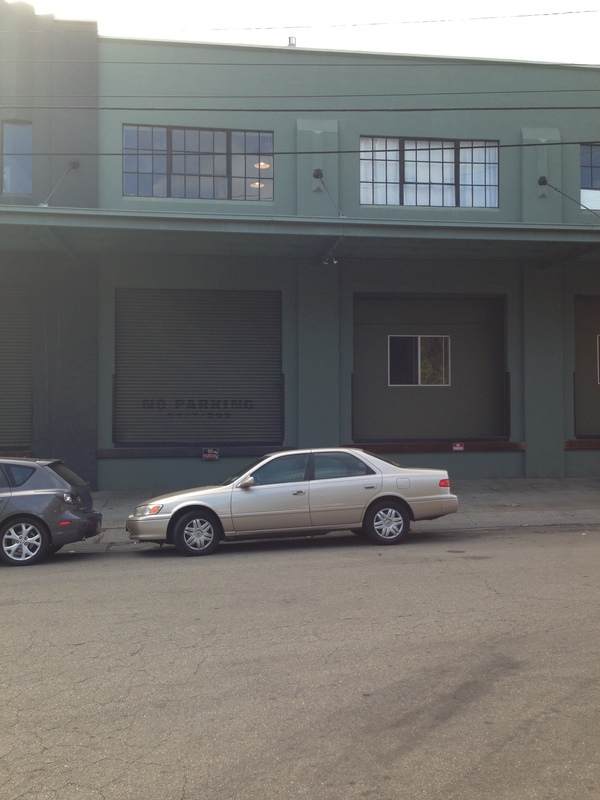 As I started developing my parking strategy near the office, I avoided three loading docks between 217 and 229 Harrison St. in Oakland. 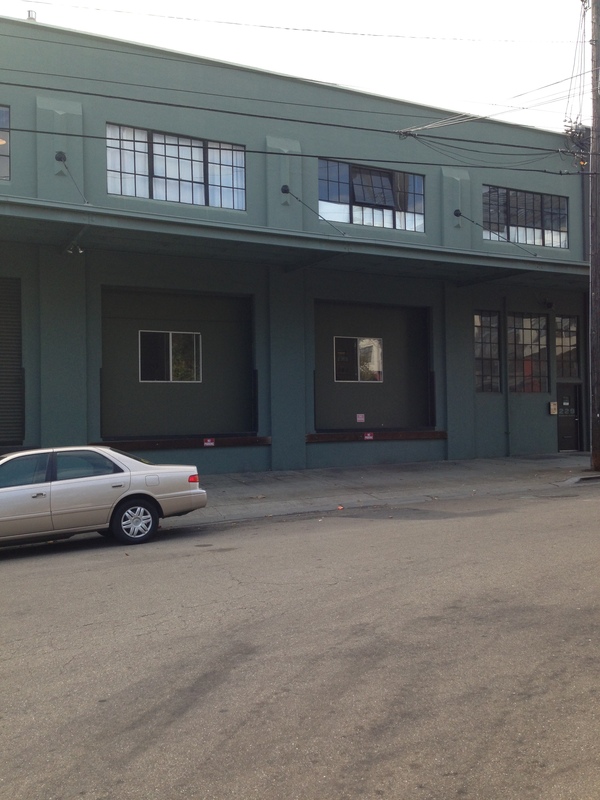 If you click on the link, you’ll see there are 4 loading docks, but there is a stair case in front of one. It turns out, there are walls behind loading dock doors. There is not a loading dock behind the doors, there is an office with a small window on each wall. Of course each loading dock door is painted with the logo “No Parking 7/24/365.” When they raise the doors, they also have no parking signs, the type you’d buy at the office supply store for $2.99. These are, on the walls and the remaining loading dock edge. Since you can’t simply put up a sign to prevent the public from parking in front of your wall (as opposed to a garage or loading dock), I consider this their art project. I park there all the time. It is very convenient to work. The third time I parked in front of this office, a note was left on my car. I was appalled at the audacity of whoever left it. How dare they say I couldn’t park there? I guess they believe by putting up those silly signs they believed they were writing new laws. Delusional and petty were the words that came to mind. I took the paper and put it my car to throw away later. Why litter? 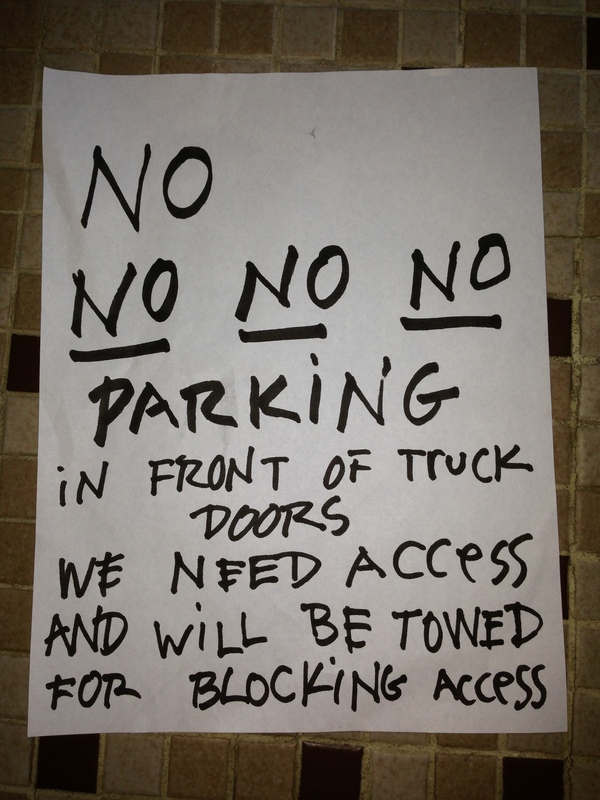 It is hard to imagine what went through the broken mind that wrote this note. I guess a single “no” was not enough. Bold strokes and underlines were also required it seems. And, as you have clearly surmised, knowledge of the law is not necessary to create nasty notes. It is not illegal to park in front of an office wall. At least to my understanding of traffic laws. I guess intimidation works. The spots in front of the loading docks are open fairly often. From the notes they leave on cars and the effort they’ve put into their “art project” I have concluded that these are not stable people. I’m not inviting them over for dinner. Given my druthers, I’d park elsewhere, but these are convenient spots. Over the last 11 months I’ve collected 8 flyers. Maybe they will appreciate like baseball cards. Actually, I wet them, and stick them back on the windows of their office. It is my way of adding to their public art project. I assume they wanted participation. A few weeks ago I was not parked in front of the loading docks, but I noticed that 4 cars had notes on them. The last one as I walked by had 2 notes. I had to laugh as I noticed the flyer on the driver’s side was from the car’s owner. I don’t recall the exact words, but the note called the “parking authority” on the concept of having a legally parked car towed. Earlier I had come to the conclusion that the building wanted the parking spaces kept empty so they could use them. What hubris, I thought. The next day I had this confirmed. I had parked in front of the stairs, which is a spot that is never harassed. Behind me they had put out orange cones to keep the spaces empty. Hubris is not strong enough word. The cones were stamped “apple bottom” or something equally ridiculous. Not PG&E, a cable company, a phone company or the government. My quick thinking lead me to believe these were a public danger, fallen off the back of some turnip truck. It was my civic responsibility to removed them from the street, to protect other members of the community. I picked them up and stacked them on the stairs. Crisis Averted. Later I came back to my car to go to lunch. The cones were back and there was a note on them. I figured someone else could move them this time. I’d move them after lunch. After lunch, as I surmised, someone else moved them. I sense a movement starting in the neighborhood. The other day I was meeting a friend for coffee. I went downstairs to meet him and ran across him coming out of our parking lot because it full. Being ever the quick thinker, I jumped in and guided him to these often vacant stops. After we parked and started to walk away, some sort of sad station wagon pulled up. A woman of certain age leaned out the window. She was a sad case. Her hair was dyed too dark, with an overly trendy and trying too hard platinum stripe ringing her face. I stifled a laugh as she called out to us. “It’s not a loading dock. It’s a wall.” I laughed out loud. I looked at the window. The glass didn’t pop out. The screen was roughly 1.5 feet by 3 feet. Its bottom edge was over 7 feet off the sidewalk. I should my head. We walked away and ignored her as we went for our coffee. I saw her glaring at me that night when I walked back to my car across the street from her office. This ends year 1. I predict year 2 will be an all our war. Writer’s Note: I spoke with a traffic enforcement officer the other day. I asked about the legality of these notes and the threat of tow. She laughed. She suggested that if they tow me, I should sue. I am wondering if I should harass them, as they have harassed me.